Welcome to the website of Holy Wisdom Orthodox Church. We are a small rural parish of the Most Holy Church of Ukraine (Orthodox Church of Ukraine - Православна церква України (за кордоном) located in the woods just outside the Tahoe National Forest in Nevada City, California, half-way between Sacramento, California and Reno, Nevada. Whether you are a guest, an inquirer, or a visitor from another parish, we are pleased you are here. The purpose of our web site is to introduce you to our parish community, and to provide you with a brief overview of the Orthodox Church and faith. 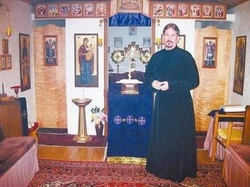 Our priest, Father Paul is personally available to answer any questions you may have about Orthodox Christianity, or about your spiritual experience, or personal faith journey. As a visitor to Holy Wisdom we want you to be as comfortable as possible on your visit with us. This section covers some of the practical questions you may have as a newcomer or inquirer. In addition, some of these questions and others are covered more extensively in some of the other sections. Yes! We are a community largely comprised of converts to the Orthodox Church, and are very comfortable with newcomers, inquirers and visitors. We come from all racial, age, ethnic, and economic backgrounds. Every sincere lover or seeker of Christ, or non-Christian inquirer is welcome. 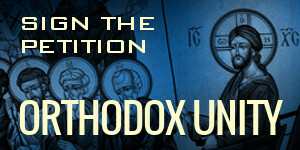 We can probably anticipate many of your questions about the Orthodox Christian faith. We’ve all been there! So don’t be afraid to ask questions about what we do and why (at the appropriate time, of course!). When you enter our church which is in rural residential area, we have printed service texts of the Divine Liturgy available on the table along the right wall as you enter the church nave, the sacred space where the congregation worships. Our normal Sunday service is the Divine Liturgy of Saint John Chrysostom which is the liturgical service followed by all Orthodox Churches word-wide. You may follow the service text, or, if you prefer, simply close your eyes and enter into the Church’s beautiful worship of God. Following the Sunday Divine Liturgy, you are invited to join us for a “fellowship hour” which is a good time to get to know our parish members and meet our priest. If you are not interested in social interaction at first, that’s fine. You are always welcome to follow your own pace and level of interest. Daily Vespers services (Evening prayers – Wednesday nights at 5:30 P.M.) are generally thirty to forty minutes in length. The general rule for men and women is to dress appropriately, modestly and respectfully, because we stand before the living God. Visitors however wear everything from jeans to suits, long dresses to skirts, tee shirts to shirts with ties, dress shoes to sneakers. We ask, however, that you do not wear shorts, mini-skirts, tank tops, low-cut or strapless dresses (unless covered by a sweater, etc.). Some Orthodox women wear head coverings, but this is not required. Men are asked not to wear head coverings (baseball caps, etc.) in the nave. Each parent is responsible to take care of their child. We encourage children to be present in Church for the services. This participation is part of a child’s spiritual formation. However, if your baby or child gets fussy, talkative, or has a melt-down, please take him or her out of the nave until he or she is ready to return quietly! The traditional posture for prayer and worship in the Orthodox Church is to stand before the King of the universe! In the Orthodox “old countries” there are typically no pews in the churches. Chairs or benches on the side walls are usually reserved for the elderly and infirm. In North America however we tend to build our churches with pews or chairs. So you are free to sit. However, it is appropriate to stand during the Gospel reading, the Little and Great Entrances, the distribution of Holy Communion, when the priest gives a blessing, and at the Dismissal. Just follow the congregation. Most of an Orthodox service is congregational singing. Traditionally, Orthodox do not use instruments. Usually a choir leads the people in a capella harmony, with the level of congregational response varying from parish to parish. The style of music varies as well, from very traditional Byzantine-sounding chant in some parishes, to more Western-sounding four-part harmony in a Russian church, with lots of variation in between. The music is solemn, prayerful and intended to lead the faithful to worship the living God. New visitors will find there are many new things to experience in a Holy Orthodox Church service. Feel free to go at your own pace, ask any questions you want, and know you are most welcome to “come and see”. Feel free to contact Fr. Paul, or talk to one of our faithful after one of the services or during fellowship hour following Sunday Divine Liturgy. If your need is of a pastoral nature, you can call the office or leave an email request to schedule an appointment to meet with the priest.